Of all of the lands and places mentioned in the Hebrew Bible, none lie so far off the beaten path as distant Oman. More than a thousand miles away from the Holy Land, across rugged mountains and nearly impassable deserts, Oman lays claim to a site that could be the oldest of the Abrahamic tradition: the homeland of the Prophet Job. Yet for all of its improbabilities, Salalah’s assertion that Job came from this distant land is strangely, if loosely, supported by certain facts of history and geography. The tradition of Job being a native of southeastern Arabia dates back several thousand years, and no other place claims the enigmatic Biblical figure as its own. Salalah is part of the Land of Frankincense UNESCO World Heritage Site. It has been argued that no book of the Bible is more out of place than the Book of Job. It does not occupy a place in the linear history of the Hebrew Bible, and to many religious scholars it is strictly apocryphal in nature. It is also one of the few books of the Bible that mentions the Devil, and the only one in which God is portrayed in casual conversation. Modern Bible scholars contend that the story of Job may actually date back to the days of Abraham, and was passed down to his descendents, which would make it older than the stories of the Patriarchs. Oman’s claim as Job’s homeland may have more credibility than would seem at first glance. References in the Book of Job concerning the Chaldeans and the Sabeans, tribes from northeastern Arabia and Yemen, respectively, seem to place Job’s homeland in Oman. From there the tale could have easily migrated north to Ur by sea where it reached the ears of Abraham, becoming part of the oral tradition of his descendents. Job was supposedly the greatest of all of the children of the east, and if east is in reference to the lands of the Chaldeans and Sabeans, the logical conclusion would be that the land of Uz, Job’s home, would have to have been in the area of modern-day Oman. Oman’s history as a center of frankincense production also ties the region to other Biblical chapters. Salalah was, for a time, a part of the empire that was ruled by the Queen of Sheba. It is likely that the city served as a regional capital and center of trade during the age of Solomon, and archaeological remains seem to support this possibility. Local legend also asserts that the frankincense presented as a gift to the infant Jesus at his birth came from Salalah. Thus this unlikely location in the far corner of the Arabian Peninsula can be directly tied to both the Old and New Testaments. It is only in recent years that scholars have begun to give serious consideration to Salalah’s unlikely claim. Already a destination for Omanian tourists, Salalah is now drawing religious pilgrims from further abroad. In addition to his importance in Judaism and Christianity, Job is held to be an important early prophet by the Islamic faith. But as interest in Job’s Tomb and the area’s other sites grows, it is possible that the area may see an upsurge in Jewish and Christian visitors as well. The Tomb of Job is located on a hill known as Jabal Al Qar north of the city of Salalah. Jabal Al Qar consists of a small ridge that dominates a desolate, rocky terrain broken up here and there by spots of grass and frankincense trees. A circular wall surrounds the compound, which includes the shrine containing the tomb as well as a mosque. The enclosing buildings are relatively recent, however, dating only to the 20th century. The mosque is a relatively simple affair, with a low flat roof and a single minaret. The shrine is even smaller, perhaps the size of a house, with a dome over the center. Inside, beneath the dome, is a rectangular opening in the floor containing the tomb of the prophet Job. The tomb is little more than a mound of dirt, normally draped in cloth. According to tradition, another body is buried within the tomb next to Job. It is not known whose body it is, not even by tradition. A carpet near the mound conceals a footprint attributed to Job. The province of Dhofar around Salalah contains several important early Biblical sites related to the region’s frankincense trade. The Ruins of Zofar archaeological site was once an important port serving the spice and incense trade. The city of Dhofar is home to the famous Frankincense Groves which date back to antiquity and which are part of the UNESCO Frankincense Route. Based on the geographic references in the Biblical story of Job, I agree it is definitely possible that Job lived in or near Arabia. Interesting to contemplate. I actually have not visited Oman yet. It is on my list. I have recently visited Iraq. There I visited many holy places. I also went to the tomb of Prophet Job (to whom we call Hazrat Ayub a.s). There is a holy fountain which is said to cure people from skin diseases and it is said to be associated with Prohet Job ( Hazrat Ayub in islamic culture). Have you visited that too? What do you have to say about that tomb? 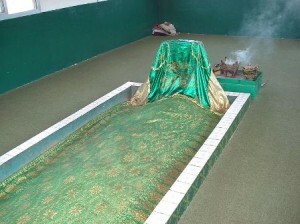 I have visited Prophet Job’s tomb. A special peace envelops the surroundings. A great spiritual experience. All of us are one. I hope I get there one day! Thank you Howard for background background information on the tomb of Job. I visited Nabi Ayoub’s during the time of the Ghareef. I walked up the hill in the mist past the pop corn and juice stalls, past the small mosque. Pilgrims prayed, kneeling around the green mound. I covered my head and stood watching absorbing the peace of the place. peered at the large footprint of Job the giant. Wondered if there could be truth to the legend of the place. I wonder that myself. Job is one of the most enigmatic figures of the Bible. The clues indicate that Job lived somewhere in the Arabian Peninsula, so Oman is not entirely outside the realm of possibility.